Flanged CD (Capacitor Discharge) weld studs are available in inch or metric variations. They are made using stainless or mild steel. 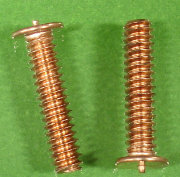 Mild steel variations are coated using copper plating to better conduct electricity. Brass or aluminum CD weld studs are also available. CD studs are either unthreaded or available with external or internal threading. Flanged CD weld studs are designed using a tip or projection on the weld end. The welding gun fires the stored electricity through the weld stud and melts the tip or projections into the base material. By using flanged CD weld studs, a strong bond between the base material and stud is created. CD weld studs can be used with thin base metals and generally provide a small weld area. CD welding provides little to no marring on backside of host metal. They are ideal for appearance based applications. For ordering information or for help in choosing the ideal fastener for your project, contact JHP Fasteners. We’ll help you find exactly what you’re looking for. Non-flanged CD weld studs are also available or for any additional industrial fastener requirement, you may have.